Do आप think Bellatrix is adorable? 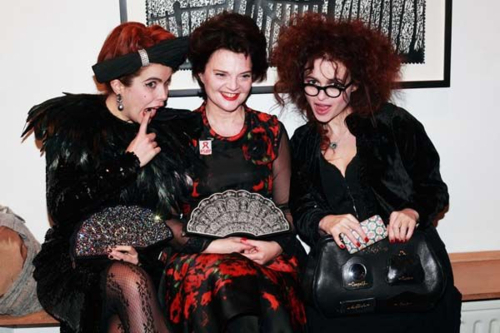 Favourite Helena Bonham Carter & Tim बर्टन colaboration? Which of Helena's relatives lived in Dorset या Devon and had an artificial leg? Also what relation was the 'air commodore'? Satellite Awards: Best Actress in Miniseries of टेलीविज़न Film - "Burton&Taylor". Screen Actors Guild Awards: Outstanding Performance द्वारा a Female Actor in a Miniseries या a टेलीविज़न Movie- "Burton&Taylor"
1979-Her father went deaf on one ear and got paralyzed. Helena won the सेकंड place at a कविता contest. So, i think the शीर्षक says the lot:) There are much और ways, but this is a pretty good start. 1 .If आप can´t decide which shoes to wear, wear one of each. 2 .Don´t behave the way आप are expected to behave, behave the way आप want to behave. 4. Use all the opportunities to quote Helena या some of her characters. 5. Visit लंडन just because Helena lives there. On Tim's reaction to Billy's birth: I think the birth was a bit of a shock to Tim. He was down there, shouting, "I'll catch it!" like he was a rugby ball या something. I was saying, "Look, Tim, it doesn't just shoot out." There's 48 hours of contractions and agony first. WERID FACT:THAT TOMORROW IS JOHNNY DEPPS DAUGHTERS BIRTHDAY THE दिन AFTER HELENAS 27 MAY 2011 LILY ROSE MELODY DEPP!!!!!!!!!!!!!!!!!!!!!!!!!!!!!!!!!!!!!!!!!!!!!!! On Saturday, some lucky test screeners in Chicago got the opportunity to see the first cut of "Harry Potter and the Deathly Hallows: Part 1." The CGI wasn't completely finished, it had a stand-in score and its runtime was 150 minutes, but the response from the प्रशंसकों was overwhelmingly positive despite any issues they may have had with the first cut of the movie. Who is in this picture with Helena?